Over the years there have been a number of Rose Havens, ranging from Langley, British Columbia to Grey County and then Prince Edward County in Ontario, but all in Canada. Most were sheep farms followed by fibre arts stores. Now the cycle has begun in a new location and form as I have semi-retired to Ecuador. To the right is the house as I arrived; much has happened since. For those of you who are a little unsure, Ecuador is a small country of 15.49 million (2012) people on the Pacific coast of South America. To the immediate north is Colombia and to the south is Peru. Most of you know of Galapagos which is 1000 kms. off shore and is a unique part of Ecuador. The other areas include the Pacific coast, a segment of the Amazon and the Andes. 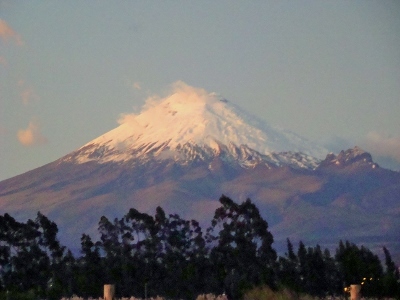 I have moved to the Cotopaxi region in the Andes about 1.5 hours south of Quito, the capital. The new Rose Haven is a 3.4 acre (1.5 ha.) 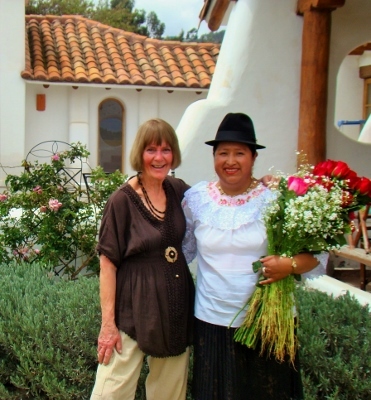 parcel of farmland with a beautiful adobe house and a smaller home for my support person Isabel and her family. On clear days one can see Cotopaxi Volcano, over 19,300ft., Ruminahui Volcano and Tungurahau Volcano but mostly I look at gentle hills and small farms. The nearest community is Poalo, a village area of about 1000 persons, at an elevation of 8800 ft. Poalo serves a rural indigenous community with basic needs like convenience stores, small lunch cafes, primary and secondary schools, a health clinic, an internet communication centre, a Catholic Church, a public central park and an upcoming cheese factory. The farms around support dairy cattle, alfalfa, some tomatoes and roses in green houses, a few sheep, llamas, alpacas, chickens and geese. I am not as one might say in the café latte crowd! But the people are kind and helpful. Only 12 kilometres away is the nearest larger community, Latacunga, a city of about 100,000 persons with all the basic services such as hospital, pharmacies, university, government offices, bus terminal (very important to me), parks and shopping. 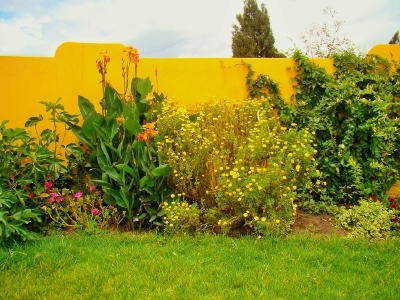 The community is also the location of the Cotopaxi International Airport which mainly serves cargo flights for the important Ecuadorian floral industry to cities such as Luxembourg. However, there are some passenger flights to places in Ecuador like Guayaquil. Having an airport nearby is fantastic. But even the Quito airport is only about 1.5 hours distant. Some of you may remember that Canada has winter!!! This area of Ecuador is the Andes and I am less than one degree south of the Equator. Generally the climate is temperate, meaning it can go down to a nice sleeping temperature of 10 C. but in the day easily rise to 15-28 C. and with the sun right overhead, that can be warm. It can hit 0C. but only for a couple of hours as hibiscus are perennial plants in the village and the house has papyrus so it can’t stay low very long. And no snow except on the top of Cotopaxi! And the cost of living is certainly much lower than in Canada which is very helpful. The taxi to Latacunga is $5 but you can travel much cheaper in the camionetta for 50 cents, and for me only $1.50 by bus to Quito. Food costs are reasonable and there are also markets. I am getting a good handle on electricity and water, fair but not scary. And heating is minimal, just the fireplace or an occasional electric heater, plus of course your sweaters. And my house is interesting. 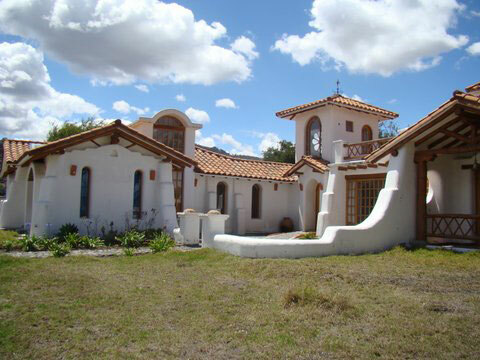 It is made of adobe, mud blocks, painted white with a red tile roof. 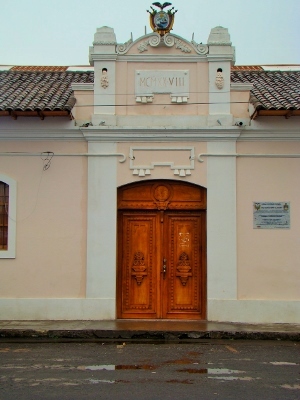 Built in 2009, it was originally designed by a Quito architectural firm to be a small scale restaurant in the country. 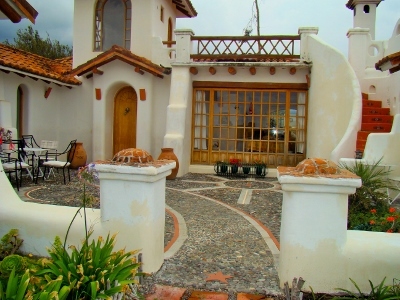 Not as logical in layout as some houses it none the less has delightful unusual features like a tunnel hallway, a mirador lookout, a charming patio with moon and sun symbols in the stonework, rounded windows and doors, sculpture niches, and lovely red tile floors. And even enough space for a bit of a "studio” to me. In addition the property has been like a blank canvas waiting for me to bring it alive. I began by planning for gardens, edible, medicinal, floral and for dye stuffs, maybe even plantings of alfalfa and a wee alpaca or 2 (but give me time). And, of course, I will hunt for roses – I gather that David Austens can be grown here and a very large local rose farm has them! I only landed here in Ecuador on December 12, 2013. I have lots of ideas but in the short term I focused on making everything here function. That meant washing machine, stove, water heater, dog proof fencing, finished lighting, applying for my Ecuadorian residencia (essential if I want to stay), learning how to work with a support person --- a privilege I have never had before, salvaging my arthritic leg following my horrendous move, getting my composting going and it goes on. around my house to create a more sheltered area for gardens. Bit by bit gardens have been added and the property is becoming more beautiful. 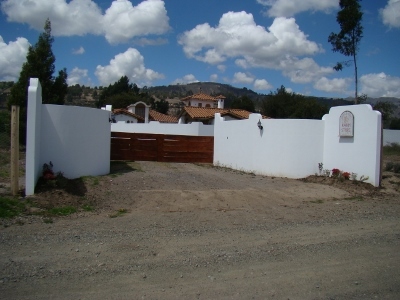 I have some external fencing and a curved wall entrance with a low gate to help keep our dogs safe. And I have done much to make Isabel's house more habitable for her and her family. And I have had a few out-of-country friends visit and I believe I understand they found my new Rose Haven very welcoming. Isabel and I hope you can join us. Please come and let Rose Haven welcome you!